Do you have quince growing in your region? We can find it here in Western New York from a couple local farms in the fall and occasionally in the grocery stores in the fall and winter. They are a very hard fruit that needs to be cooked before eating. A few years ago my husband and I discovered this old Bing Crosby Christmas song "Christmas Dinner Country Style" (if you've never heard it, check it out - it's great) on a holiday album we bought. I absolutely love the song, and then became kind of obsessed with the idea of pickled quince at a holiday table. Lucky for me I have a copy of Ripe and it contains a whole section on quinces and also a recipe for pickles. I actually made these pickles last year at this time, but ran out of time to post them before quince season was over.... so I saved them until now. Now is the perfect time to scout out some quince and make a batch of pickles to serve along with your holiday roast, turkey, or ham. These pickles offer a unique and lovely compliment to roasted meats - sharp, sweet, tart, and delicious. They will keep in the refrigerator for several weeks and indeed I'd recommend making them at least one week ahead of when you want to eat them so they become extra flavorful. In a large stainless steel pot, heat the vinegar, sugar, juniper, black peppercorns, and bay leaf and bring to a boil. Reduce the heat to a simmer and stir occasionally until the sugar is dissolved. While the mixture is heating, peel, core, and cut each quince lengthwise into six pieces. Add the quince to the pot and cook, stirring occasionally, until the fruit is fork-tender. This will take about 20-30 minutes. Let cool and place in a glass jar, covering with the cooking liquid. Cover the jar and store in the refrigerator until serving. 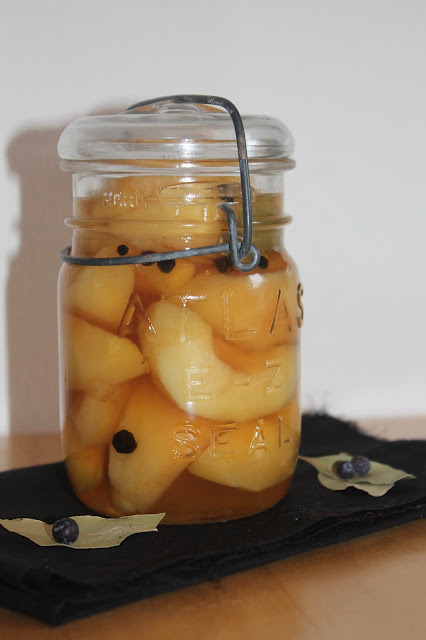 I have never tried quince before, but I love anything pickled, so I am sure that I would love this. I have never had pickled quince before! You have me really curious! 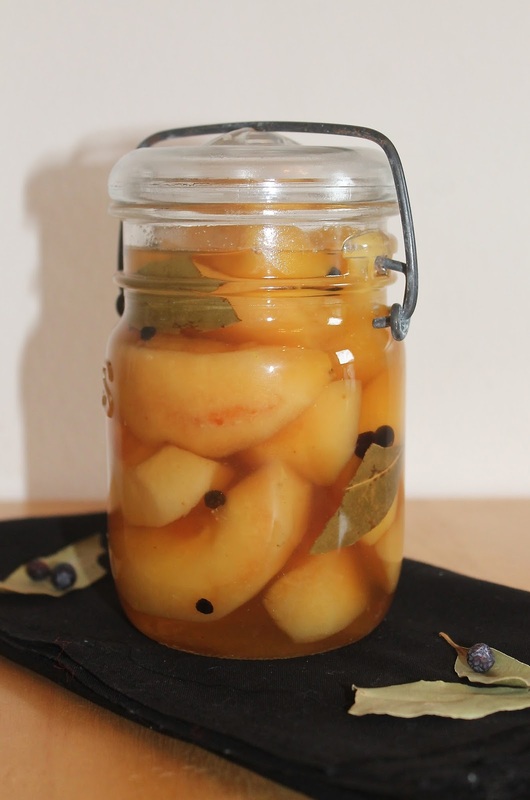 I've never tried pickled quince before - it sounds fabulous! I usually just poach quince and eat it as is. I've always wanted to do more with it...perhaps pies & jams. I haven't had quince in a few years - now I'm going to have to pick some up! I have never heard of quince, but it sounds good! 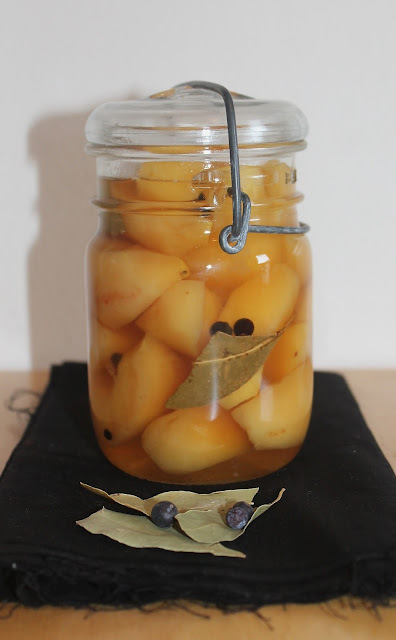 I've never tried pickled quince before..yours sounds quite easy to make and very tasty too, Amy. Amy, we do find quince around here and altghough we do not have a quince tree in our garden, I always look for them at the farmers´ markets in the region and cook and bake with them I have never tried to pickle them though, looks like a wonderful way to prepare these wonderful fall fruits.